The GP220AAH/T is a rechargeable Nickel Metal Hydride battery and is AA in size. Please note that these are industrial flat top cells and are designed to be used primarily in battery packs. These batteries are made to the highest quality standards and have the additional benefit of being qualified to the UL standard for product safety. This makes them the ideal choice when working with battery packs. It is not recommended to solder directly to the battery, hence the addition of flexible solder tabs is required. 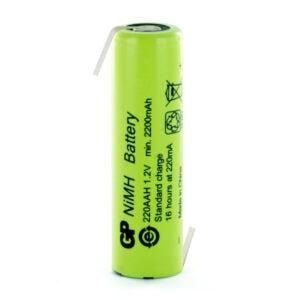 The cells are nominally 1.2V, have a typical capacity of 2200mAh, with a minimum capacity of 2250mAh. They can tolerate discharge currents of between 220mA and 6600mA and should give you around 500 charge and discharge cycles. The GP220AAH/T is a widely used in many applications and we quite often supply them as spare batteries for rechargeable toothbrushes and rechargeable shavers. So far seems to do the job well, not had any issues and was packaged well, delivered very quick and the tabs attached well. 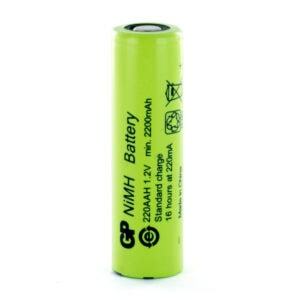 This battery is the ideal replacement for the Philips 481 shaver unit. Replacement battery for my Phillishave. Arrived quickly, works fine, and even though the postage was more than the battery itself the overall cost was far less than anywhere else. Perfect delivery much faster than I was estimated. I am happy to recommend cellpacksolutions.co.uk for your battery needs. Battery for my razor at good price, works well and fast delivery. As others already stated P & P expensive but goods arrived before advised date, have yet to fit the battery this will be my third one on different Braun tooth brushes all same models, quite time consumming operation but worth the savings over a new tooth brush. Battery working well. Agree postage and packing costs on the high side so bought two to make it more bearable. On the other hand this is the second time I have replaced the battery saving myself the cost of two toothbrushes at £50 a time, so no real complaints. Goods as ordered, arrived very promptly and have given my electric razor a new lease of life. Battery is good, although exchanging it for the old one in a Braun toothbrush was not a job for the faint-hearted who don’t know their way around a soldering iron and de-soldering techniques. But as has been said by others, p&p was high (appreciably more than the goods!). This is no doubt partly due to the signed-for delivery service; I’d suggest that most retailers don’t use this for such low-value items – I’m sure it discourages business and is only useful in a small minority of cases. My Philishave 860 battery was not holding a charge for more than a couple of days, so I decided to replace the battery. Despite searching the web quite intensively I could not find a battery for this model. I emailed Cell Pack Solution & within a couple of hours got a reply from John, telling me to remove the battery from the shaver & send him the details. I removed the battery as instructed but no information was present on the duff battery,I then photographed the inside of the shaver with the various numbers visible & email them to John. He then requested the physical dimensions of the battery ie. length & diameter, this I did emailing the info requested info to John. Within the day he had mailed me back with the the battery suitable for my shaver. I then ordered this battery & it arrived next day, installing only required a 2 min job with my soldering iron,the shaver has been absolutly perfect ever since. thank you Cell Pack Solution especially you John. Product is good. I up-sized the battery for my Braun3756, which required modifying the plastic battery carrier in the toothbrush. The new battery fitted perfectly. The original battery had tags which were slightly out-of-line in order to fit the dimensions of the circuit board of the toothbrush. The tags on the battery supplied were centered so that they were exactly in line, which required a little bit of fiddling to get them to connect to the terminals on the board – but no big deal, it was easy enough! I agree that the postage is a little high: I paid £2.25 for the battery (excellent) and £3.99 for postage (??) both plus VAT (£1.25). I wonder why an item of such low cost (good value!) needs to be signed-for on delivery? Perhaps this pushes up the delivery cost. However, overall I was happy with the total package. The quality is great. The battery price is also great. But the shipping cost is way to expensive as I paid £2.76 for the battery and £8.11 for postage to Norway. But I can’t wait to upgrade my Oral-B 2000 with greater capacity than original!